Use op amp circuits to build mathematical models that predict real-world behavior.The mathematical uses for signal processing include noninverting and inverting amplification. One of the most important signal-processing applications of op amps is to make weak signals louder and bigger. 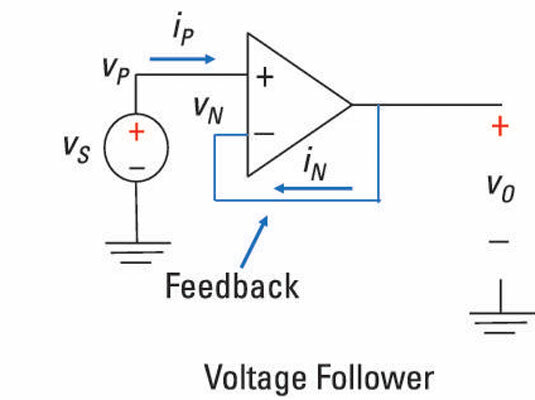 The following example shows how the feedback affects the input-output behavior of an op amp circuit. Consider this sample circuit, which first shows the input connected to the noninverting input. You have a feedback path from the output circuit leading to the inverting input. You gotta first find the voltage at the inverting input so you can figure out how the input and output voltages are related. 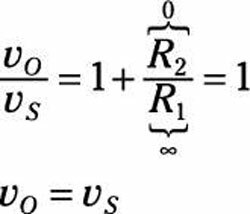 Apply Kirchhoff’s current law (KCL) at Node A between resistors R1 and R2. 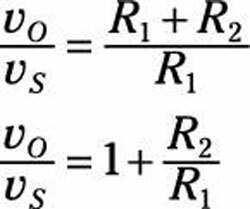 Recall that Kirchoff’s current law (KCL) says the sum of incoming currents is equal to the outgoing currents. You’ve amplified the input voltage by ten. Awesome! 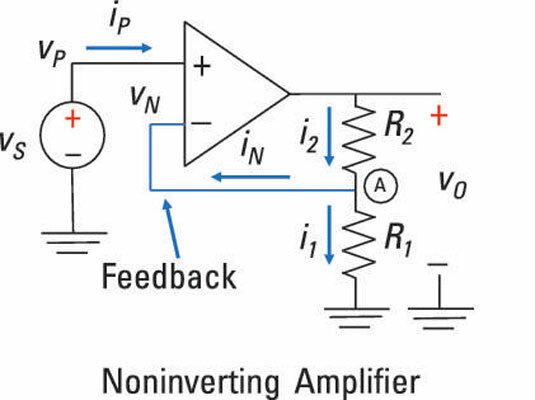 A special case of the noninverting amplifier is the voltage follower, in which the output voltage follows in lock step with whatever the input signal is. In the voltage follower shown here, vS is connected to the noninverting terminal. The output voltage vO is equal to the input source voltage vS. The voltage gain is 1 where the output voltage follows the input voltage. But a piece of wire gives a gain of 1, too, so what good is this circuit? Well, the voltage follower provides a way to put together two separate circuits without having them affect each other. When they do affect each other in a bad way, that’s called loading. A voltage follower solves the loading problem.